In our lifetimes, we’ve seen retailers dress window displays with clothed mannequins, arranged furniture or fanciful scenes — all to grab attention and ideally pull consumers through the doors. Almost every retailer, short of luxury brands, has been known to put up window posters touting price discounts, special promotions or inventory clear-outs. The latest innovation in storefront advertising is the digital display. This strategy serves the same tactics and goals, but employs different, far simpler and more flexible tools. 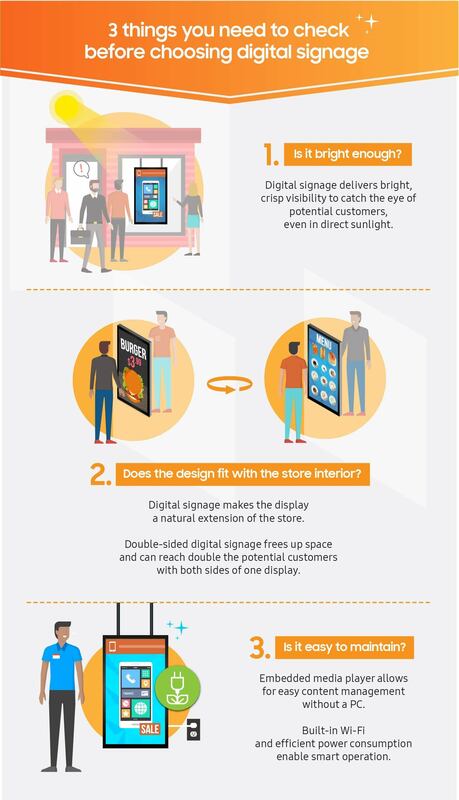 We’re seeing retailers — from department store operators and brands with big, flashy flagships to local small business owners — putting screens in windows that face the street to drive specific goals like increased foot traffic and sales, improved shopper experience, and holistic branding. Paper posters and printed fabric light boxes are less costly in the short term than digital displays. However, some key improvements are driving the storefront transformation, including change-out speed, reduced resource and operation costs, increased inventory, and higher impact. Installing a new poster in a window might take a minute or two to complete, but the planning and coordination typically take weeks. The artwork has to go through the creative development and approval processes. Then the material goes to prepress and then to a printer. Then the posters must be shipped to potentially thousands of sites. All this requires complex project management and coordination, and even top retailers struggle with something called “compliance” — which is the measure of how much marketing material actually goes into the right place at the right time. With digital signage, once new artwork is created, the scheduling, targeting and distribution of new content can happen in a matter of minutes. As long as the network is set up properly, compliance should be 100 percent — something retail brands can only dream about with analog messaging. Web technologies like HTML5 even make it possible to automate window displays. Software can steadily communicate with store systems like pricing and inventory, and if a price changes or stock runs out, the price on the screen automatically updates, or a message for a promoted item stops running until inventory is replenished. One of the primary reasons billboard companies have converted their big roadside signs to digital is they now have the ability to sell and then run as many messages as they want off a single billboard “face.” The same thing applies with window displays — with retail brands equipped to run as many messages as they want and do things like schedule different messages for different consumer profiles by time of day or week. 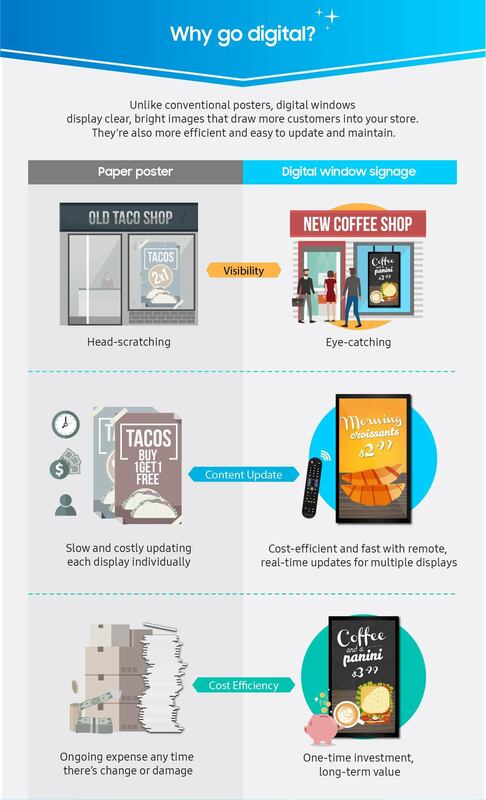 A fast food operator with a printed window poster for a breakfast special gets nothing out of that messaging for much of the day, but digital signage enables the operator to tune the message as consumers’ needs change, highlighting lunch specials, drive-home specials and late night snacks. Adding digital means adding video and motion graphics and the ability to sequence messaging statements. With print, messaging needs to be short and sweet. With digital, less is still more, but one promotional spot can cycle through multiple benefits, price offers and calls to action without forcing all that information into one image. Conventional digital signage monitors may work in limited circumstances, but most window displays require high-brightness LCDs equipped with enough lighting power to overcome bright sunny days on the streets or even inside spaces with big windows and glass ceilings. Because of the nature of LED display design, realizing 4K resolution might require filling a full window with display modules. But an LCD can deliver 4K on a single 55-in. display, and narrow bezel models can be tiled together for in-window videowalls delivering incredible detail. Although LCDs look great in windows, the rear of the displays typically either look like the backs of TVs or like big, bland boxes. 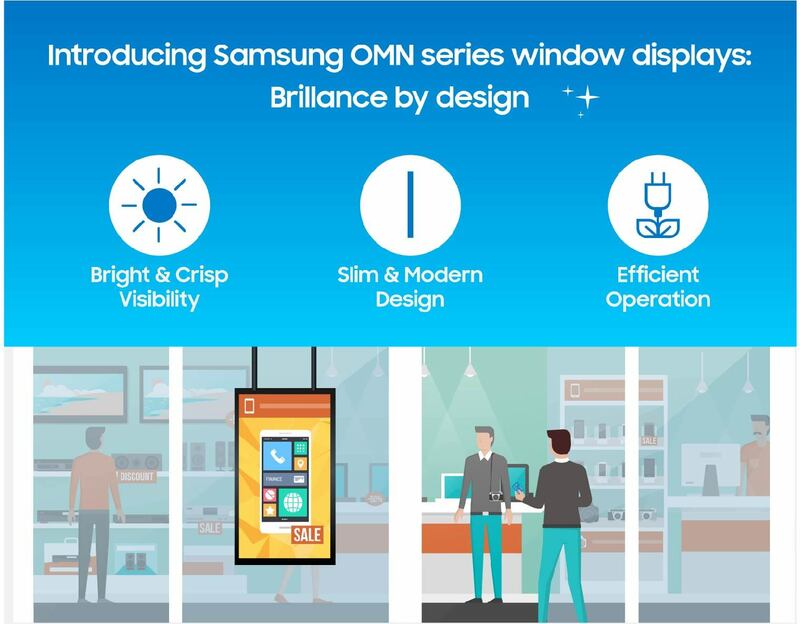 Samsung recently solved that problem with a super thin back-to-back display — using a high-brightness LCD facing out to the street, and a more conventional monitor facing into the store. These dual displays can play the same messaging, or run separate images or videos, depending on merchandising and marketing needs. 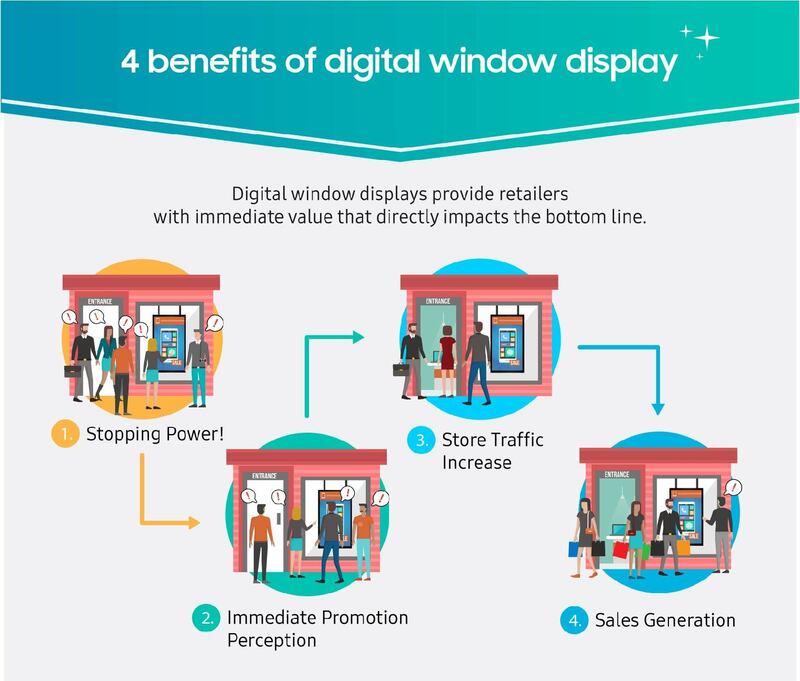 For retailers and visual merchandising teams who decide to start applying digital to their windows, there are several ways to assess the value and impact of the screens. Sales increases are the most obvious indicators, but sales may climb for reasons beyond window display messaging. It might be as simple as a low price that brings people in. The classic way to measure the impact of in-store marketing is to measure what happens in a set of stores that have added things like window displays, against a set of stores that are similar in terms of normal sales performance, foot traffic and shopper profile, but that do not have those displays. Computer vision technology, sometimes called audience analytics, can also track which marketing messages on screens get people to stop, and for how long they look. Retailers can then use all that data to compare against store performance indicators, giving them a far richer understanding of the impact of window marketing initiatives and the data they need to make adjustments and optimize. Is a digital window display right for your business? Probably. But before diving straight in, plan. Define objectives. What will the screen be used for and how will success be measured? Audit the site. Is the window in direct sunlight? All day? Part of the day? This will affect what brightness levels a screen needs to support, and its ability to bear the heat-load and glare of the sun. Determine the content plan. Is messaging big and bold and best filling a full window? Then go with LED. Is fine detail more important? Maybe try LCD. Optimizing outdoor signage is one way retailers are engaging broader audiences and pulling increased foot traffic. Learn how to drive new sales and marketing opportunities with the right outdoor digital signage.